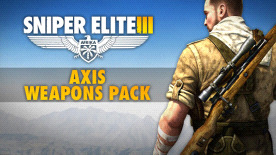 Turn your enemies’ best weapons against them with the Axis Weapons pack. Including weapons from the German, Royal Italian and Imperial Japanese armies like the Type 99 – king of the long distance rifles. All three weapons can be used in any multiplayer, singleplayer or co-operative game mode in Sniper Elite 3. Type 99 rifle: Japanese made with a higher zoom and lower recoil, this bolt action rifle is one of strongest long range weapons available. MAB 38 submachine gun: boasting an improved rate of fire, range and zoom this Italian submachine gun has a distinct advantage over most. Army Pistol 38: used by German officers and soldiers alike this semi-automatic pistol has a strong rate of fire whilst still maintaining its impressive range.